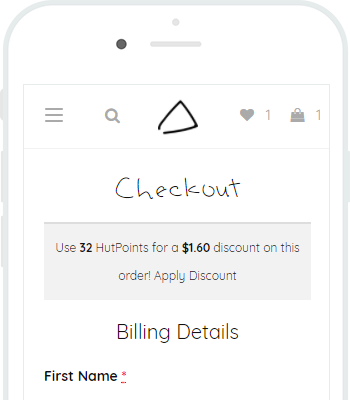 HutPoints are like a currency for exclusive use here at Health Hut and can be used to pay or or part-pay for your orders. HutPoints are awarded to registered customers for every dollar you spend with us and also for certain other actions such as leaving a product review or simply spreading the good word. How Do I Earn HutPoints? Registered customers earn 1 HutPoint for every $1 you spend with us. HutPoints are earned on the total order value. Leave a product review and star-rating on your recent purchase. Plus you’re also helping other customers. Earn 100 Points just for registering an account with us. We’ve made it really easy to register at checkout too. Every customer who uses your invite code to make purchase will receive a discount on their order and you earn HutPoints. Win-win! For our truly loyal customers, we’ll reward you more HutPoints when you reach a specified spend threshold. Every now and then we’ll run a promotion on certain products or brands that earn more HutPoints than usual. So check back regularly. HutPoints are an added bonus and just one of the ways we thank you for being a loyal customer. 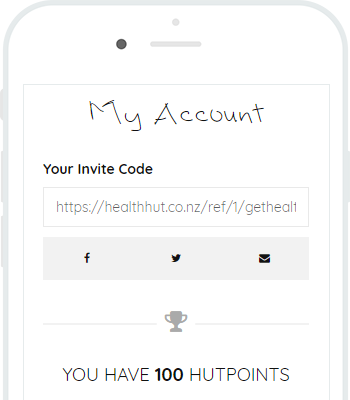 Sharing your invite code is the easiest way to rack up HutPoints to spend at Health Hut.